Bars will be flooded, the streets will be packed, and the atmosphere will be awesome! When you think of Chicago on St. Paddy's, you think of the green river and the amazing parade. 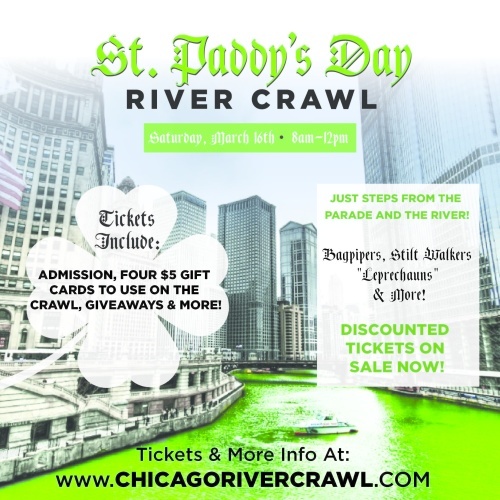 Well, why not join the only St. Paddy's Day crawl that is just steps from both! On the Chicago River Crawl you'll gain entry to Chicago's top bars situated in the heart of River North! No transportation or long walks!! All of the venues are within walking distance so you can spend more time enjoying green beer and partying with friends. This year we went even bigger! We have stilt walkers, bag pipers, "leprechauns," and more! Guests will gain entry and four $5 Gift cards to be used at stops along the crawl. This is the ultimate self guided tour with hours of fun before the start of the parade. The river goes green at 9am so make sure you start early!